A sculptural pink column forms shelves for nail polishes in this Montreal beauty salon designed by local studio Ménard Dworkind, which also features hacked pink armchairs and IKEA sinks as foot baths. Ménard Dworkind created the 650-square-foot (60-square-metres) Hideout on the ground-floor of a new condominium building in the city's Griffintown neighbourhood. The architecture and design team had a limited budget, and so sought ways "to get creative and invest in strategic places". The main splurge was the decorative pink-painted MDF structure in the middle of the salon, which disguises a large concrete column. Vertical spines curve outwards towards the top, where greenery pokes out. Horizontal struts are slotted in between, creating nooks in the middle of the structure for bare wooden shelves and a mirrored beauty counter. "The central column was dressed with a CNC-cut floral form that grows up and onto the ceiling," Ménard Dworkind told Dezeen. 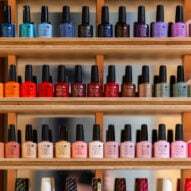 "This central structure was designed to contain nail polish displays, make up stations and storage." The design was modelled using Google Sketchup software, then its individual components were laid out in AutoCAD before sent to the computer numerically controlled (CNC) cutting machine. The method helped the studio to ensure that no material was wasted. A similar process was also used for the matching pink laser-cut steel counters, which splay out behind the MDF installation to form manicure stations. 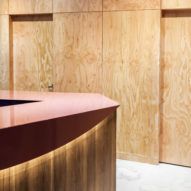 One side of the steelwork continues up over the salon's reception desk, while the other folds over the end of the counter, "recalling a painted nail", according to the design duo. Three spray-tan rooms run along the rear of the store, while pedicure stations are mounted on white-tiled platforms towards the front of the glazed shop. 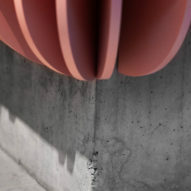 Ménard Dworkind created the seats by hacking pink Structube armchairs, and removing their legs, while the footbaths are circular white IKEA sinks. Additional details are provided by the cylindrical wooden rests placed behind. Warm-hued Douglas fir panelling lines the walls, while the existing concrete is left exposed and untouched throughout. 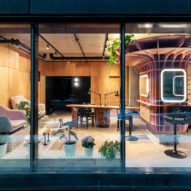 "This warmth contrasts with the raw concrete floor, which still has construction notes and markings," said the firm, which was founded in 2017 by designer Guillaume Ménard and architect David Dworkind. Dworkind has completed a number of interiors in Montreal, prior to setting up the collaborative office. These include a falafel shop "inspired by a classic New Balance sneaker" and a Lebanese snack bar and bakery. He has also worked as a designer on a number of projects with architecture studio Naturehumaine, including a residence in Quebec set atop a bulky concrete wedge and the renovation of a mid-century Montreal house with plant-covered wall. Photography is by David Dworkind.